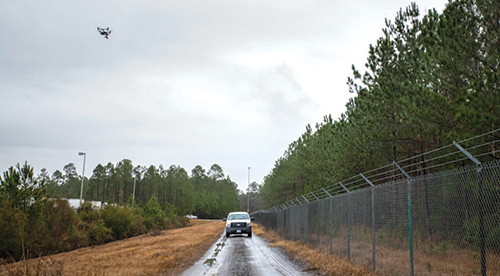 Since mid-2017, SAV officials have been working with Woolpert to develop protocols that will allow unmanned aircraft systems (UAS) to patrol the airport’s 12+ miles of perimeter fencing, assist with wildlife management efforts and perform runway pavement inspections. Employees currently use utility terrain vehicles to monitor the perimeter fence and keep tabs on area wildlife, but the tasks can be very time-consuming—especially if a vehicle gets stuck in the mucky swamp. “It’s a safety issue, too,” Rahn points out. “Here in the South, we have snakes, alligators, fire ants and spiders. And if someone doing wildlife mitigation inspections is wearing hip waders and they fill up with water, the person can easily drown. Thomas Mackie, aviation practice leader and a vice president at Woolpert, considers it part of the company’s job to help SAV and other airports navigate the thicket of FAA rules that regulate drone use. The first step includes drafting a Concept of UAS Operations—ConOps, for short. This document addresses a wide range of factors such as flight schedules, risk management considerations and communication protocols. “While all airports have distinct needs and directives, this guidebook illustrates how commercial airports can conceptually go about flying a drone in support of operational needs,” says Mackie. One significant consideration is coordinating with air traffic control to define acceptable drone operating areas, times and conditions. Developing protocols for emergency response should something go awry during a drone flight is another important precursor, he notes. Airports also need to determine factors that could have a detrimental impact on drone operations at their specific fields. For example, are there areas where radio frequency interference could affect the control of drones? Are there line-of-sight limitations such as hangars or other buildings that could prevent air traffic controllers from seeing drones? “Such blind spots (communication or line-of-sight) are a problem…you have to figure out how to mitigate those factors with your flight plans,” Mackie advises. At SAV, drone flights aren’t expected to last very long, and they’ll occur in small areas, which makes such issues more manageable, he adds. Drone operators are required by the FAA to obtain a license, maintain continuous visual contact with their aircraft, and maintain radio communication with air traffic controllers when flying a drone in controlled air space. Initial drone test flights occurred at SAV in January. Operations were conducted in four different areas of the airport and were pre-arranged with the FAA, Rahn notes. The verdict: Drones can be used safely and efficiently for routine operational needs such mitigating wildlife hazards and performing daytime perimeter checks. In fact, the value of using drones was underscored when one of the test flights revealed that a fallen tree had broken through the perimeter fence on the swampy north end of the airport. The area is particularly difficult to access on foot or by watercraft, but the drone safely and efficiently collected GPS coordinates of the fallen tree and transmitted real-time imagery of the fence breach, Mackie explains. Before conducting the test flights, SAV officials used software to establish a geofence—a virtual boundary for the drone that is similar to invisible electric fences that keep pets inside residential yards. Test flights indicated that the Inspire 2 drone, made by DJI, was best suited for SAV’s needs, Mackie reports. The unit weighs 7.58 pounds without extra equipment on board, and its gimbal—the pivot point where a camera can attach—rotates 360 degrees. The drone can accelerate from 0 to 50 mph in just five seconds, with a maximum speed of 58 mph. According to specifications on DJI’s website, the Inspire 2 can fly up to 27 minutes before its two batteries need recharging. The camera’s high-resolution capability increases the drone’s ability to operate safely, because it doesn’t have to get as close to objects or areas SAV personnel want to view. This could prove especially valuable for operations in controlled air space. “We can fly farther away from aircraft and still collect data that provides a great service to the airport,” Mackie explains. 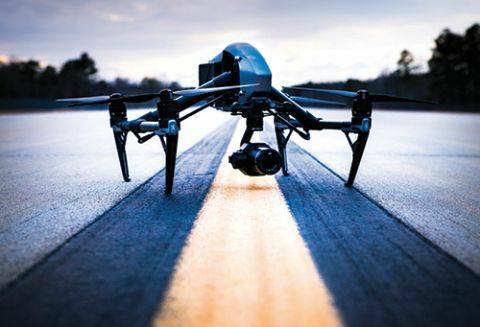 The Inspire 2 also features “swappable payload” capability. This would allow SAV personnel to switch, for example, from a thermal camera that detects heat emitted by people or animals to a special multi-spectral camera that can detect objects invisible to human eyes, such as tiny growth on vegetation. Mackie lauds the DJI drone’s control station software for providing versatile flight planning capabilities. An operator can fly it autonomously by programming a flight plan or fly it manually via a joystick and an iPad. “It really gives the operator a lot of flexibility in terms of flight planning and in overriding the controls if hazardous situations arise,” he comments. The next phase of SAV’s drone implementation program will include flying drones in airport operating areas; obtaining FAA approval; validating that a drone can be used safely to support additional airport missions; helping SAV staffers obtain drone pilot licenses; and refining the systems, sensors, processes and data management techniques to reflect the airport’s needs. Phase three, which Woolpert estimates is about one year away, will focus on acquiring a drone. At SAV, Woolpert is working toward using drones to augment existing operations, rather than just for single missions such as a construction project or pavement study. The company has already performed aeronautical surveys and base mapping for the airport and has loaded that data into an asset management system called Cityworks, from Azteca Systems. Eventually, information gathered by drones will be integrated into the system.